easy-on+ anti bacterial coating incorporates Akacid (plus), a biocide proven to disrupt the cell surfaces of bacteria and reduce hospital acquired infections including MRSA, E Coli, Salmonella and Listeria. Tests by the biomedical research department at Sheffield Hallam University have shown that when panels coated with easy-on+ were contaminated the added Akacid (plus) provided continuous protection from bacterial infection, HAI’s and fungal growth and eliminated all hospital pathogens within 340 minutes. This evidence combined with easy-on’s durable nature make easy-on+ anti bacterial coating a longer lasting and more cost effective alternative to silver ion technology. easy-on+ anti bacterial coating is perfect for all situations where hygiene is essential, easy-on+ should be used to offer anti bacterial protection in hospitals, vets and food preparation areas. Once applied easy-on+ still offers all the benefits of our standard easy-on protective coating and will withstand 100’s of cleaning cycles and last for up to 20 years. 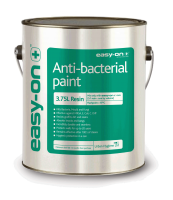 easy-on+ anti bacterial coating is available as a clear finish and can be applied over any existing bare or painted surface including brick, stone, plaster, metal, powder coatings, plastics and woods. easy-on+ anti bacterial coating enables hospitals, vets and food preparation companies to save money whilst reducing infection and improving the aesthetic environment. easy-on anti bacterial coating = visibly clean and hygienically clean walls and surfaces for up to 20 years. Does not support colonization of bacteria. MRSA related bacteria eradicated in 1 – 24 hours. ~97 – 99.7% reduction without additional cleaning. In tests, Akacid solution eliminated all hospital pathogens within 340 min. Coated surfaces do not support spores or fungal growth. Suitable for almost any clean and dry building and finishing material or surface. Frequently used to overcoat and upgrade existing paint finishes to reduce redecoration cycles. Easily cleaned with a wide range of products. Biocide works even after multiple cleaning steps. Coating performance is proportional to the degree of surface preparation. Surface must be clean and dry (<6% moisture), undamaged and free of all contaminants prior to coating. Prepare damaged areas to original surface preparation specifications, feathering edges of any damaged but intact coating system. For optimum application, temperature of the material should be between 10ºC and 20ºC prior to mix and application. Gradually add total contents of Cure tin into Resin tin and mix thoroughly to a uniform consistency. Apply one thin coat by brush or small roller without diluting. Use a cross-lapping method of application to avoid misses and ensure corners and edges are covered. If the surface is porous do not attempt to cover with one application. Apply a thin coat, leave for 3 – 4 hours to partially reduce porosity, and then apply a second light and even coat. Substrates Concrete, tile, mortar, existing coatings, plaster, brick and metals, timber, etc.